- First delivery to V. Rothermere (Daily Mail) - Since 1932 with 4.5 litre engine DS 3558 - One of only 1620 built copies - FIVA car pass Vehicle history: Between 1923 and 1929, about 1620 chassis were produced with the 3-liter engine. The Bentley 3 Liter was the first independent vehicle under the name Bentley. 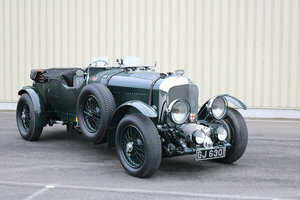 1924, the year our vehicle comes from, Bentley was able to win Le Mans for the first time with a 3 liter. This Bentley 3 Liter (Chassis 352) was delivered in 1924 to the newspaper publisher Viscount Rothermere (Daily Mail). 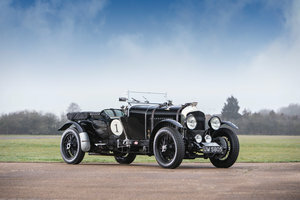 From 1927 Bentley produced the 4.5 liter engine. A 4.5-liter engine (DS 3558), which came from a car of a certain Captain Pollen, was put on this chassis in the 1930s. For a long time, this Bentley was based in Australia, from where he came back to England in 2000. Here it was restored for 10 years at the renowned Ben & Craig and equipped with this body in Le Mans style. Please ask for details!